Since my camera’s charging at the moment, no photos today – I guess you’ll just have to use your imagination! Actually, wait, maybe I *do* have a photo….oh, here it is. New project #1 – a bottom-up raglan, striped, in Lavold Silky Wool and Tweed. I love the fabric, but meh. Not very exciting. Maybe…three quarter sleeves, v-neck. Something like that. Dreamcatcher is blocking! It was a bit of a mess before blocking (all curly and small) but now it looks awesome. A button search is lined up for tomorrow. Plus, after the sleeve cap Disaster that was Cable/Rib, it’s reassuring to know that I can actually set in a sleeve and have it work. Which is good, since a couple of the projects I’m planning have set in sleeves. What else…I’ve been slacking off school (exams in two weeks? pshaw, that’s ages from now), and dyeing up a storm for myself and for the spindle class I’m teaching this Friday and next at lettuce knit – in town and wanna try your hand at making yarn? There are a couple spaces left, just give us a ring! Denny gave me a handfull of sparkly stuff to spin, and although you probably have noticed I’m not really the bling type, I can’t wait to ply it into some pink merino I’m working on right now. Let’s hope tomorrow’s button jaunt is successful, so I can show you all a new and very cool sweater! Wow you have been super busy. Can’t wait to see what buttons you’ll use. 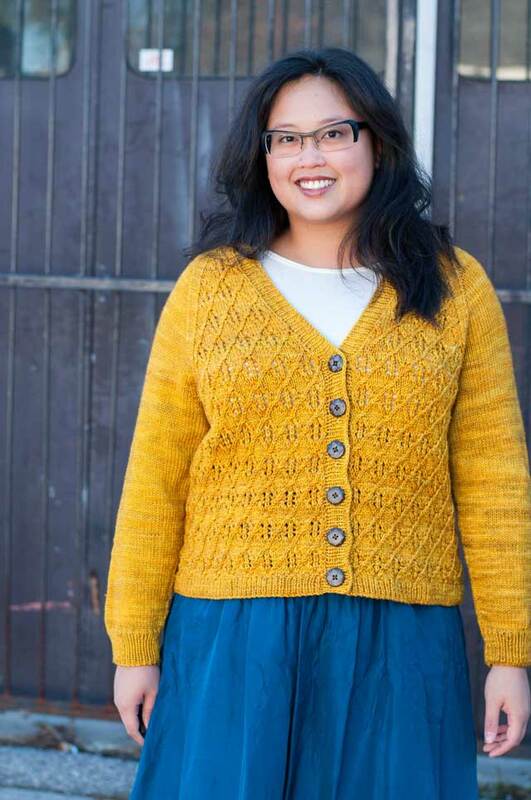 have finished the sweater…it is divine and has inspired me. Where are your button haunts. I don’t find much inspiring stuff in Fabricland.